Alciato at Glasgow: Emblem: IN STATUAM AMORIS. Eius qui vario nomine gesta ferunt. Tela alasque ferens, lumina nulla tenet. Link to an image of this page [E8r]Si licet in vates falsa subesse reor. Qui cunctas domiti possidet orbis opes. Alpinum potuit, strictaque prata gelu. An nosti Ascraeii carmina docta senis. Trans adiit, nunquam linquere sponte potest. At pharetras & tela gerit, quid mutile [=inutile] pondus? An curvare infans, cornua dura valet? Alas curve tenet quas nescit in aethera ferre? Inscius in volucrum flectere tela iecur. Laedit, & haud alas saxeus inde movet. Utilis est? ideo num minus ille videt. Hic certa, ast caeci spicula vana movent. Cur age vivit adhuc, omnia flamma vorat. Quin etiam tumidis, cur non extinguitur undis. Naiadum quoties mollia corda subit. Verus quid sit amor carmina nostra ferent. Illius est, nigro punica glans clypeo. Many poets in the past have told us who Love is, recording his deeds under many a name. This they agree on - he has no clothes and is small in stature, carries arrows, wears wings, but has no eyes. This is the appearance, the bearing of the god. But if one may contradict such mighty bards, there is falsehood lurking here, I think. Why ever should he be naked? As if garments would be lacking for a god who possesses all the resources of a conquered world. Or how could he, if naked, survive the snows and North wind blowing from the Alps, the fields stiff with frost? - If he is a boy, do you call a boy one who is older than Nestor? Maybe you know the learned poem of the old man of Ascra? A child is changeable, but he is stubborn - the hearts he has once pierced he can never leave of his own volition. He bears quivers and arrows - why this useless burden? Has an infant strength to flex the stiff bow? - Or why does he have wings, when he does not know how to take to the air with them? He has no skill to direct his arrows at the liver of birds, but steals along the ground and always hurts the mortal hearts of men. Hard as stone, he never stirs his wings from there. - If he is blind and also wears a bandage, what does a blindfold do for a blind person? Surely he doesn’t see any less because of it? Or who would believe that anyone carries arrows when he is deprived of sight Love shoots straight, the blind shoot arrows at a venture. - He is fiery, they say, and has flames leaping in his breast. Then why is he still in existence? Flame consumes everything. Indeed, why is he not quenched by the swelling waves whenever he steals into the tender hearts of the Water Nymphs? In order not to be deceived by such great errors, do you listen and our poem will tell what Love truly is. It is a work of delight, the frivolous occupation of leisure hours. Its sign is a Punic fruit on a black shield. 1. ‘snows and North wind...fields stiff with frost’. These are traditional hardships endured by the hopeful lover who finds the door shut against him. See e.g. Horace, Odes 3.10. 2. Nestor, king of Pylos, who had outlived three generations of men, was a proverbial example of extreme old age. 3. ‘the old man of Ascra’, i.e. the poet Hesiod who, at Theogony 120, describes Love as a primeval cosmic force. 4. The liver was held to be the seat of the affections. 5. ‘hurts the mortal hearts of men’. Cf. Anthologia graeca 5.10, where Love attacks men, not animals. 6. ‘the...hearts of the Water Nymphs’: a reference to the many legends of water nymphs and other water spirits succumbing to love. 7. ‘Punic fruit’, i.e. the pomegranate. Possibly the connection here is the rough aftertaste it leaves and the likelihood of it being bad under its smooth skin. The pomegranate is a symbol of Aphrodite, the goddess of love. Emblematum liber (28th February, 1531), Augsburg: IN STATUAM AMORIS. Emblematum liber (1534), Augsburg: IN STATUAM AMORIS. Emblematum libellus (1534), Paris: In statuam Amoris. Livret des emblemes (1536), Paris: In statuam Amoris. A la statue damour. Les Emblemes (1539), Paris: In statuam Amoris. A la statue Damour. Les Emblemes (1542), Paris: In statuam Amoris. A la statue d'Amour. Emblematum libellus (1542), Paris: In statuam Amoris. Von dem bild der Lieb. In zal der rheymen nach dem Latein, vers gegen vers. Los Emblemas (1549), Lyon: Contra la estatua del Amor. 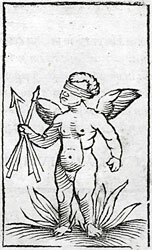 Emblemes (1549), Lyons: Sur la statue d'Amour. Emblemata (1550), Lyon: In statuam Amoris. Emblemata (1551), Lyon: In statuam Amoris. Diverse imprese (1551), Lyon: Sopra la statoa dAmore. Emblematum libri II (Stockhamer) (1556), Lyon: In statuam Amoris. Toutes les emblemes (1558), Lyon: Sur la statue dAmour. Liber emblematum ... Kunstbuch (1567), Franckfurt am Main: In statuam Amoris. Abconterfeyhung der Lieb. Emblemata / Les emblemes (1584), Paris: In statuam Amoris. Sur la statue d'Amour. Emblemata (1591), Leiden: In statuam Amoris. Declaracion magistral sobre las Emblemas de Andres Alciato (1615), Najera: IN STATUAM AMORIS. Les emblemes (1615), Geneva/Cologny: A la statue d'Amour. Emblemata (1621), Padua: In statuam Amoris.